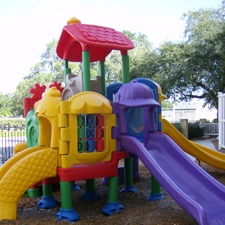 First For Kids is a licensed facility and a general member of the United Methodist Association of Preschools. First For Kids has a nurturing environment where we prepare children to succeed in school and life. Your child will have many learning opportunities and experiences to grow intellectually, socially, emotionally, physically and spiritually. First For Kids Preschool is a licensed facility and has earned a Gold Seal Accreditation from the United Methodist Association of Preschools. The school was opened in 1989 and has been serving the downtown community ever since. We are conveniently located in downtown Bradenton; parents are always welcome to come for lunch or drop in on their break. With the coded access door, you can feel assured that your child is in one of the safest preschools in Bradenton.